My heater ac control module had to be changed. So you know what I am talking about it has the heat and blower flow *****. AC and Defroster button. I purchased it onebay since the rear defroster button plastic latch broke and easier to but a whole used one. Works fine. now. I also replaced the cigarette lighter TOYOTA 8551533010 Genuine OEM Lighter Assy Stay. It holds in the cigarette frame lighter in place and after years of use was not being held in. Leaving number since it was hard to find and the cigarette lighter or todays term 12 volt supply wears out with todays USB phone charger use so as to help someone. My question with the old and new module the lights on them still don't work. I have to tap on them to work at night to see the blower controls. Once I tap on them they work until it's jiggled but the new module lights stay on longer. The cigarette light, radio and all other dash light all good. Have you check electrical harness plug connectors for the console? It seems to be working fine now and only if I tap on it hard and it flickers. Will leave as is but could be harness and wonder if it could be the bulb. Maybe the years of use partially break the bulb connection. I am looking to buy a new bulb. The old one from the old module I can't remove it from the socket or maybe it comes that way. Attached is bulb from old HVAC module. Green cover is removed. 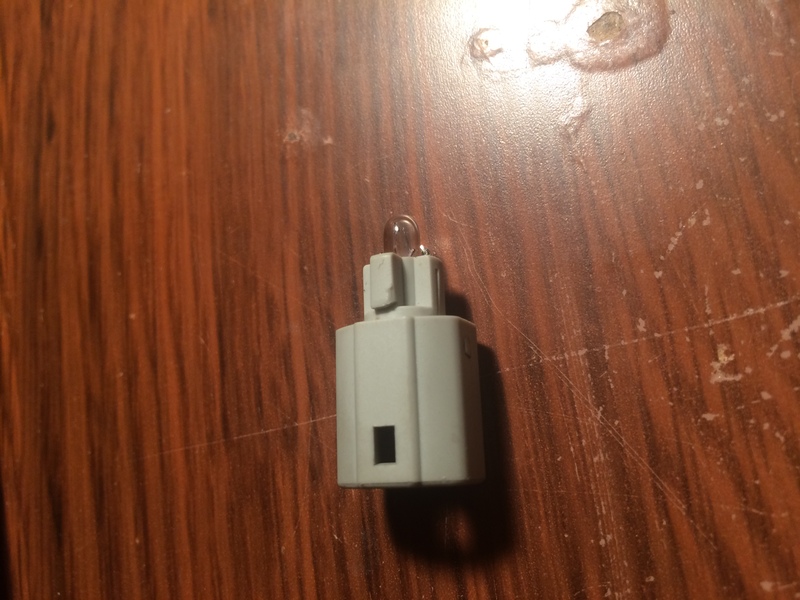 Is this a blade bulb? Search internet on "replacing 1995 Camry climate control light". I was able to pull out the bulb and with a microscope, yes a microscope, read the writing on the bulb and write down the bulb information. I think it's 203 JKW. I don't have the paper I wrote it down with me. Hope that helps others. The bulb is super tiny, hence a microscope to read it. It appears to be a #203 bulb.